Bra-vo To Specialist Insulin Pump Clothing From Anna PS | Life, Sport and Diabetes - An everyday look at my life with type 1 diabetes. As I mentioned in my recent blog about getting back on track with training, I recently did my first track session in a while and I was really excited to be able to do it wearing my new Anna PS sports bra that the Swedish clothing brand sent me to try. The clothes at Anna PS are designed by founder Anna who has type 1 diabetes herself, and wears an insulin pump. So knows about the needs of someone who has to wear a device at all times, but that doesn't want it to get in the way of real life. 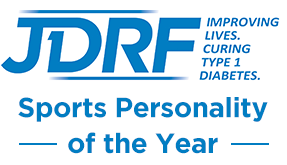 I've been on an insulin pump myself for over 7 years and have been an athlete for 10, and specialist clothing to help facilitate my diabetes equipment is something that I've only dreamed about for a long time. The only things I've ever had to put my pump in during sport before, are leggings with a back pocket which are okay, but that are no good for hot training days during the Summer. I alternatively used to wear an armband that was meant for an MP3 player, but it used to jiggle when I ran and was no good for block starts where you have to sweep your arms in extreme directions. So when I first came across the Anna PS brand whilst I was at the blogger event in Berlin, I immediately appreciated the intuitive design of the products. 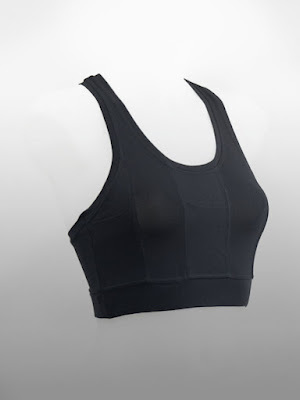 The sports bra that I tried in black has three separate pockets; left, right and centre front, which were the perfect size to hold my insulin pump. I went with putting it in the centre front pocket because I like the idea of feeling streamlined when I'm running. The other clever thing about the bra is that it has a button-hole on the inside that can be used to (when disconnected from the pump) feed the wire through from the inside (but don't forget to reconnect). I then placed the pump inside the pocket, which also has a flap to replace over the pump so that it sits securely. The racerback design of the sports bra gave me the freedom to move, run, jog and complete my drills and throughout the pump was held in place. It didn't fall out at all and there was very little movement. In terms of how the bra compares to others that I've tried on the sportswear market, I would say that the bra was of medium impact support. So for women who are large chested, they may choose to wear an additional bra underneath for high impact sports. But I was happy with the level of support provided, the band under the bust gave a secure fit and the seams were of a high quality so as not to cause irritation or discomfort. I tried the Anna PS sports bra in a size Medium, and normally I wear a size 8-10 clothing in top sizes. I really liked this product and for me it might even represent a turning point for me in terms of my sport and diabetes because in times gone by I've had to disconnect from my pump during training... But not now. Keep up to date with my thoughts on the sports bra as I start to enter winter training on Twitter (@MelStephenson01) and Instagram (Torchbearer2012) and check back in for my upcoming reviews on my fashion drop from Anna PS, the video for which can be viewed here. For more details on the specifications and usage of the 'Boxi 2 Sport Bra' that I tried click here!